More than a Pair of Chutes: Eggs for my friends - Yay for bloom! Eggs for my friends - Yay for bloom! I took this picture last night as I was washing eggs for a friend at church. She caught sight of the blue and green eggs I gave someone recently and came straight to me to ask for some. My friend bragged to her girlfriends about them and they didn't believe her. So, I promised to bring her proof. I really like my colorful egg basket. They range from brown with dark flecks, light brown, cream, white, olive to blue. All from different chickens. 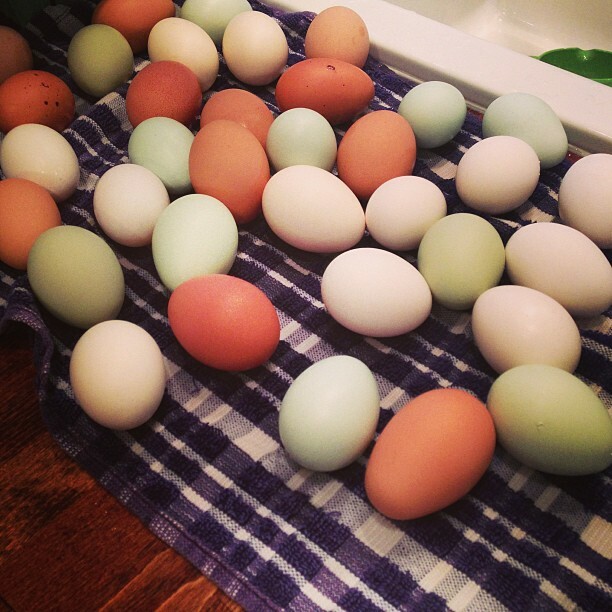 I can tell which girl laid which egg. I don't usually wash eggs. Why? They're covered in a "bloom" that protects them from bacteria. Egg shells are porous, and the bloom keeps the bad stuff from getting into those pores. Eggs you buy in the store have been washed so they don't have the bloom any longer. They go bad much faster than my farm fresh eggs. Mine may last 6, 7, 8 weeks or longer. There you have it, that's why the eggs from the farmers market have a little mud on them. Be grateful for it. I agree! When I give our eggs to friends and tell them they can leave them on the counter, they think I'm lying!